Do the entire world a once-in-a-lifetime favor this Halloween and let them see something truly mythical, magical, and majestic. Something that has only ever been written of in books and seen in dreams (okay, and movies, too): You! 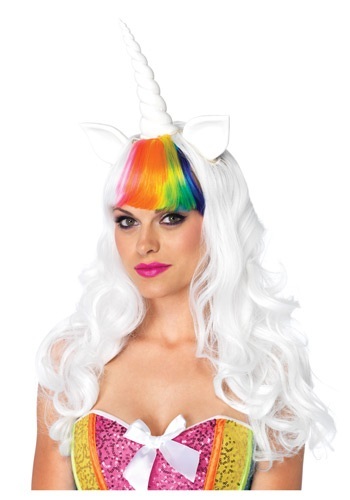 You're already a figurative unicorn (according to pretty much the whole world, anyway), but now you can be a literal one this Halloween with this awesome Unicorn Wig and Tail set! The headpiece includes a flowing mane of luscious white locks and rainbow-colored bangs. Naturally, there's also a pair of white ears, and the crowning feature that makes a unicorn so rare... and the source of its name, of course... the horn! (Sadly, only one is included. Because you're a unicorn) And let's not forget that tail, which is rainbow-colored to match your super-cute bangs... and your rare, elusive personality. With the Unicorn Wig and Tail showing off the true you, you'll capture the attention of every mortal you encounter this Halloween!